Kelly does morning feedings at the barn where her horse is boarded. Most of the horses just get a “scoop” or two of “pellets”, plus a bit of beet pulp. The ponies get less, the school horses and hard keepers get more. Until recently, Kelly had never thought about anything other than maintaining her horse’s weight and energy level. She hadn’t considered whether his vitamin and mineral requirements were being met. Actually, she didn’t even know the “pellets” they feed are a fortified grain containing added vitamins and minerals. Then her barn participated in a survey to help them determine how many of the horses were getting their vitamin and mineral needs met from their grain ration. They were shocked to discover that over 40 horses out of 60 in the barn (including Kelly’s!) weren’t being fed enough of the fortified grain to cover their nutrient requirements, and therefore needed a multi-vitamin/mineral supplement. This is common. 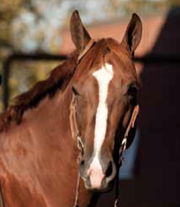 Fortified grain provides a complete and balanced selection of nutrients, but will only meet 100% of a horse’s vitamin and mineral needs if you feed the full amount recommended on the feed bag for his age, weight and workload. But because horses have such varying energy (calorie) needs, many of them don’t actually need that much grain. 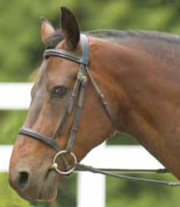 In fact, feeding excessive amounts of grain is unhealthy for your horse’s digestive system and puts him at risk for serious problems like ulcers. 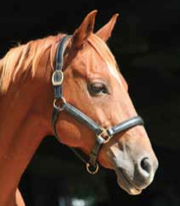 Every horse should eat 1-2% of his body weight per day in hay or other forage. Then he should be fed the minimum amount of grain he needs for energy depending on his workload, life stage and whether he is a hard keeper, easy keeper or somewhere in between. 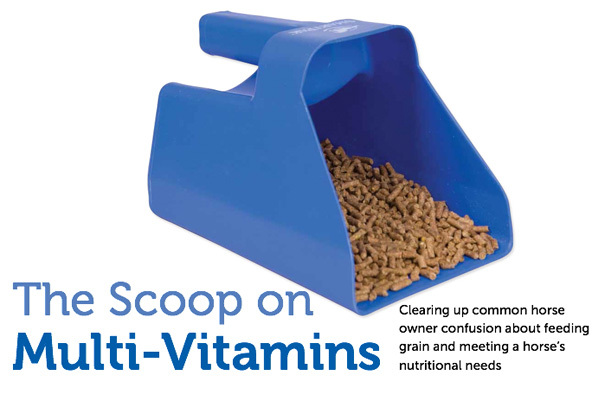 For horses that don’t need much grain, multi-vitamins are the perfect solution to provide the nutrients they need, without the calories they don’t. Use the following examples to rethink whether your horse’s needs are being met by his daily feed ration, and which supplements can help fill in the nutritional gap. Since Maverick is being fed the full amount of fortified grain recommended on his feed bag for his age, weight and workload, plus has access to fresh pasture and unlimited hay, he is getting adequate vitamins and minerals from his diet. The verdict: No, he does not need a multi-vitamin. Though “complete feeds” are designed to take the place of both hay and grain, Elvis’ scenario is common—many horse owners feed complete feeds as if they are a fortified grain. This is okay, as long as you supplement the nutrient difference. 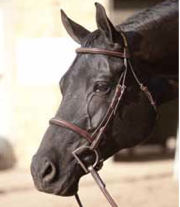 If your horse gets a complete feed, check the bag. These feeds are bulky, to provide fiber, and a “serving” is as often as much as 15 lbs daily. With only 2 lbs of complete feed and no fresh pasture, Elvis isn’t getting the vitamins and minerals a senior horse needs to feel good and have a strong immune system. The verdict: YES, he needs a multi-vitamin. Willow is a Morgan, lending her to be an “easy keeper.” Despite being in work and having a restricted calorie diet, she remains on the heavy side. Willow is a great example of how heavy horses can be deceiving! It is correct to restrict her calories, but eating such a small amount of fortified grain and having no access to pasture means she needs a supplement to provide vitamins and minerals without the unneeded calories of grain. In fact, it is imperative that Willow gets a supplement for the nutrients she needs. The verdict: YES, she needs a multi-vitamin. Night Shift is in work and tends to be a “hard keeper,” so he does well with the added fat and calories from rice bran and oats. But those whole grains don’t provide significant vitamins and minerals, and he isn’t getting enough fortified grain to cover those nutrients either. Additionally, horses in hard work have greater requirements for vitamins and minerals in order to stay healthy and perform at their best. As well as a depleted intake of vitamins and nutrients there are many more toxins in the atmosphere that can directly damage our vitamin levels so even those who eat a perfectly healthy diet may find benefit from taking a nutritional multivitamin supplement.